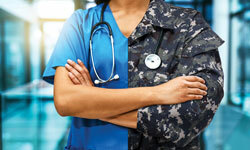 A UF Health physician and Navy veteran uses her military and medical experience to provide exceptional care. It was a day that shook the country to its core. Millions of Americans were glued to their televisions in horror as footage of hijacked airplanes crashing into the World Trade Center was repeated over and over. The tragic event motivated a medical student at the University of Cincinnati to sign up for the U.S. Navy. Jones was later stationed at Naval Air Station Jacksonville in 2010 when she got the news that she was being deployed to northern Afghanistan. For 10 months, she provided critical care on a surgical team that supported a U.S. Army Delta Force group. During her deployment, Jones directly cared for severely injured troops and conducted more than 90 emergency resuscitations. She administered more than 100 hours of intensive care and managed the logistics of critically ill patients. While in Afghanistan, Jones also met her husband, a German special operations forces combat medic who also served as one of her surgical team’s translators. “We met in 2010, got married in 2013 and have been together ever since,” Jones said. Shortly after her return, Jones joined UF Health Jacksonville, where she applies the skills she gained in the military as the medical director of the intensive care unit. Jones continues to serve as a liaison with the Navy, where several medical students rotate through UF Health Jacksonville’s medical intensive care unit, pediatric intensive care unit and emergency room for their residency program. As a result of this partnership, Jones was awarded the 2018 Admiral Paul Kaufman Award in August. 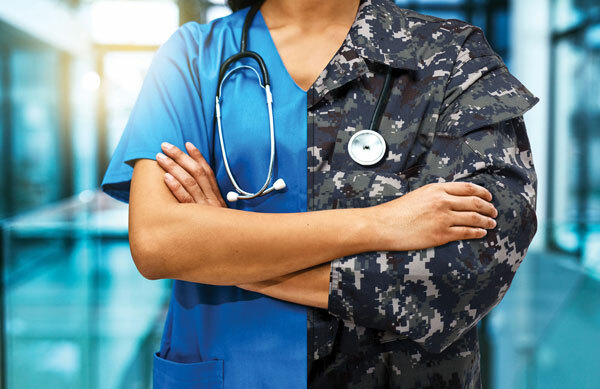 The annual honor is given to a local physician or health care professional for delivering outstanding community service to Naval Hospital Jacksonville beneficiaries and staff. Jones is one of about 500 people employed by UF Health, who are enlisted military or veterans.